How to secure communication of mobile/roaming users using Secure Gateway Server? This document will explain you the steps involved in securing the communication of roaming users using Secure Gateway Server component. Secure Gateway Server can be used when roaming agents (on the mobile devices and desktops) access the server through internet. It prevents the exposure of Desktop Central Server directly to the internet by serving as an intermediate server between the Desktop Central server and roaming agents. This ensures that the Desktop Central Server is secure from risks and threats of vulnerable attacks. 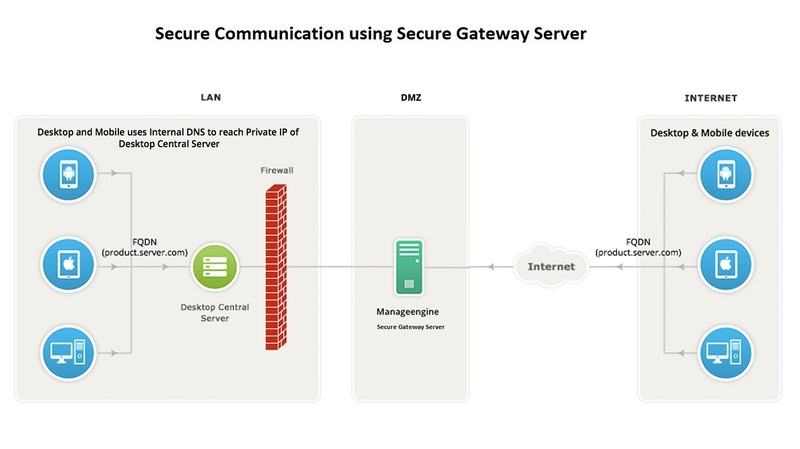 How Secure Gateway Server works? Desktop Central Secure Gateway Server is a component that will be exposed to the internet. This Secure Gateway Server acts as an intermediate server between the managed roaming agents and the Desktop Central server. All communications from the roaming agents will be navigated through the Secure Gateway Server. When the agent tries to contact the Desktop Central server, Secure Gateway Server receives all the communications and redirects to the Desktop Central Server. Note: Map your Secure Gateway Server's public IP adress and Desktop Central server's private IP address to a common FQDN in your respective DNS. For example, if your FQDN is "product.server.com", map this to both your Secure Gateway Server and Desktop Central server IP address. By this mapping, the WAN agents of roaming users will access Desktop Central server via Secure Gateway Server (using internet) and the agents within the LAN network will directly reach Desktop Central server, hence leading to quicker resolution. Enter Secure Gateway Server IP address instead of Desktop Central server IP address under Desktop Central server details while adding remote office. This is to ensure the WAN agents and DS communication to Secure Gateway Server. Enable secured communication(HTTPS) under DS/WAN agent to Desktop central server communication. Configure NAT settings using the Secure Gateway Server's public FQDN/IP address. Download and install Secure Gateway Server on a machine in Demilitarized zone. Enter the following details under Setting up the Secure Gateway Server window, which will open after the installation process. Web Socket Port : 8443(HTTPS), this will be pre-filled automatically. If the build number is below 90056 and if you are using self signed certificate, follow the steps given below. For build 90056 and above, this is done automatically. After copying the certificates, click install to complete the installation process. Configure Secure Gateway Server in such a way, that it should be reachable via public IP/FQDN address configured in NAT settings. You can also configure the Edge Device/Router in such a way that all the request that are sent to the Public IP/FQDN address gets redirected to the Desktop Central Secure Gateway Server. You will have to ensure that the following port is open on the firewall for the WAN agents to communicate the Desktop Central Secure Gateway Server. You have now secured communication between Desktop central server, WAN agents and roaming users. Thanks for your submission, We will get in touch with you soon. Name * Please enter your name. Email * Please enter a valid email id. Please enter a email id. Phone * Please enter the phone number. Country * Please select your country. Country No. of computers * Please enter the no. of devices.